The animated Spidey movie has its star, and it’s not Peter Parker. 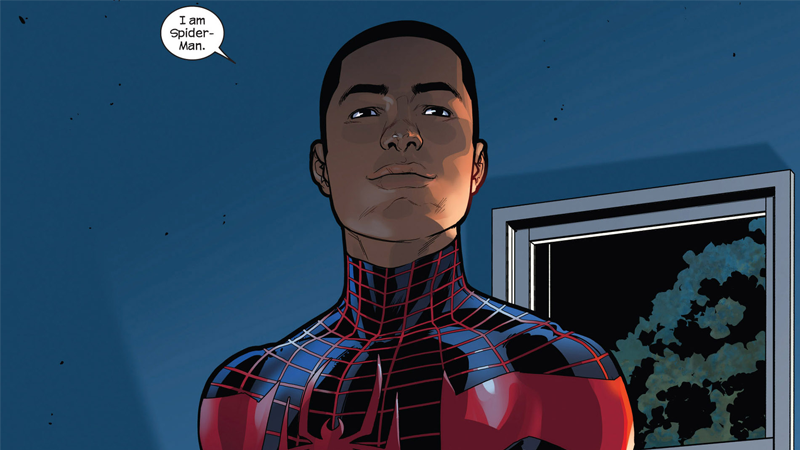 Miles Morales, the Ultimate Spider-Man, has been confirmed today as the protagonist of Phil Lord and Chris Miller’s upcoming animated movie. The news, out of a Sony Pictures press conference held today, also included early footage shown to press featuring Miles fighting a purple-and-yellow clad villain. Sony also re-iterated that the film will be a standalone entry with no ties or connections to the Marvel Cinematic Universe or Spider-Man: Homecoming, and confirmed that the film itself will be directed by Bob Persichetti and Peter Ramsey. It’s long been rumored Miles would be the star of the film, but it’s nice to finally have confirmation that he’ll headline the movie. Plus, it’ll nice to finally have a cinematic Spider-Man that isn’t the same old Peter Parker story. The still untitled animated Spider-Man film will hit theaters December 21, 2018.